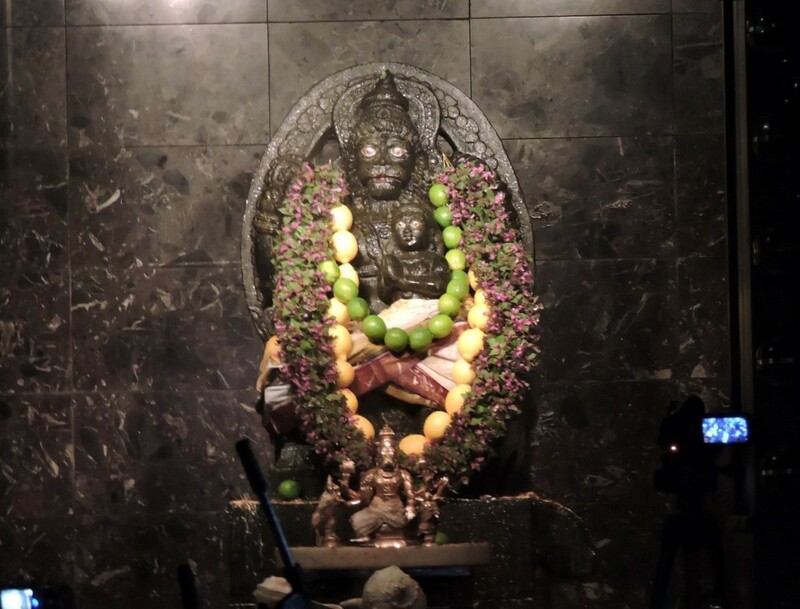 When Srila Prabhupada was lecturing on the appearance day of Lord Nrsimhadev in Bombay, he was lecturing immediately after a play and he was glorifying Hiranyakasipu because the part was played so well. 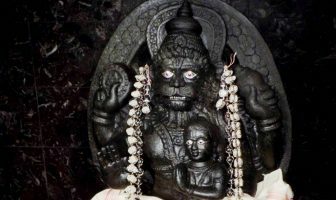 Then he explained more about the pastimes of Lord Nrsimhadev and at the end he said, “If I had more time, I would have spoken about the prayers of Prahlad.” These prayers of Prahlad were particular favourites of Srila Prabhupada and in a sense, the most important, because Prahlad is a devotee and we are following in his footsteps and are trying to be devotees of the Lord. Therefore, in these prayers, when Prahlad is praying from his position as a devotee, these are especially relevant for us. Of course, when we hear about Hiranyakasipu, we realize that there is a little Hiranyakasipu in us too! So every aspect of the pastime has its relevance but still, because Prahlad is a devotee, we want to give some special attention to his words. So, I shall start with a very short introduction. The situation was that Lord Nrsimhadev´s anger had been aroused by Hiranyakasipu. Lord Nrsimhadev’s anger was so extreme and so strong that it was still raging even after Hiranyakasipu had been killed. This whole pastime took place in the celestial regions and the demigods who were present felt the incredible, overwhelming anger! Due to the heat of that anger, they felt thrown back and they were just overwhelmed by fear and by no means could they go near the Lord. Even Laxmi Devi did not dare go near the Lord but for another reason. Laxmi Devi had never seen this form of the Lord and because Her chastity is to the Lord Visnu, She had some doubt whether She was really dealing with Lord Visnu. So, even Laxmi did not appear before the Lord. No one could. Lord Brahma could not, Lord Siva could not. None of the demigods could possibly go near the Lord! No, we should not take it in that way, we should see that Lord Brahma is most intelligent and therefore very deeply analysed the situation and also realized that Prahlad is not just a five-year-old boy, he is extremely powerful – nothing could kill him, nothing could possibly kill Prahlad! So many attempts were made to kill him but nothing worked. Then the Lord benedicted Prahlad and placed His lotus hand – I guess it is a hand or transcendental paws or whatever it was. He placed His hand on the head of Prahlad and then, it is said that Prahlad was purified, further purified from any possible influence of his demoniac birth and subsequently Prahlad started to offer prayers. Translation: The Supreme Lord, the Supreme Personality of Godhead, is always fully satisfied in Himself. Therefore when something is offered to Him, the offering, by the Lord’s mercy, is for the benefit of the devotee, for the Lord does not need service from anyone. To give an example, if one’s face is decorated, the reflection of one’s face in a mirror is also seen to be decorated. But from this verse, we see what the key is to the entire glorification of the Supreme Lord because Prahlad makes it very clear. Now Prahlad, as Srila Prabhupada states, is one of the mahajans (Srimad Bhagavatam 6.3.20). Prahlad Maharaj is one of the twelve mahajans, one of the authorities, therefore whatever Prahlad speaks is to be taken as authorized instruction. And Prahlad is stating that the Supreme Lord is atmarama, He is satisfied within the self, He does not need our glorification but the amazing thing is that by glorifying the Lord, the person who glorifies Him is purified. Just as when we decorate our face and when we look at our reflection, it is also decorated. So when we decorate the Lord in glorification, we ourselves become glorified and purified. As it is said in the Caitanya Caritamrta, Krishnadas Kaviraj Goswami says (CC Madhya 22.75) sarva mahā-guṇa-gaṇa vaiṣṇava-śarīre, and then it says kṛṣṇa-bhakte kṛṣṇera guṇa sakali. He says that all the good qualities of Krsna will manifest within a vaisnava. So it is very interesting that by serving Krsna, the vaisnava gets the qualities of Krsna. The entire glorification of the Lord is actually decorating ourselves. Although we offer Him this praise and endless glorification, our own glories are increasing. And that is a very important point made by Prahlad which really struck me very much. 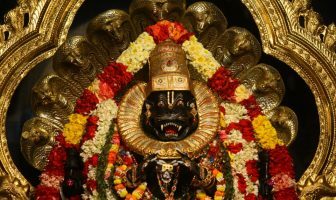 So throughout scripture, Lord Nrsimhadev is described as frightening, like in Nrsimha Tapani Upanisad, He is called bhisana or very frightening appearance. 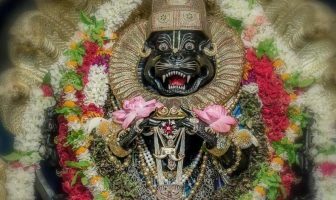 But the frightening appearance of the Lord is not at all frightening for the devotee, not frightening for Prahlad nor for the devotee because as Srila Prabhupada explains, a lion is very fearsome to all animals but not to his own cubs, right! Srila Prabhupada says, “Prahlad stands next to the killer of his father and he has a garland ready. He wants to garland the killer of his father.” It is very transcendental and quite difficult to understand for the materialists. 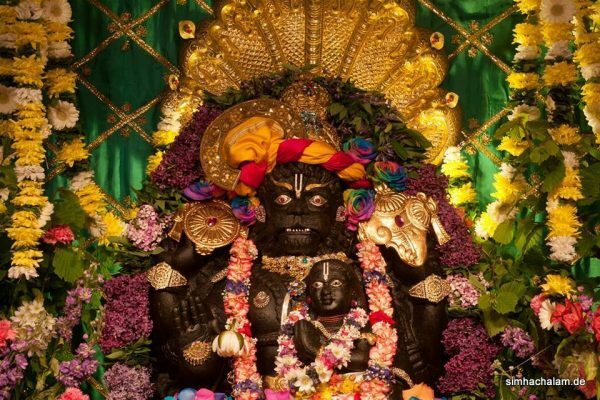 Sometimes people come into our temples and they see the painting of Hiranyakasipu and they see it for what it is and they say, “What is this?” And the devotees say, “Oh, it’s our Lord Nrsimhadev.” Because we see this all as the great mercy of the Lord, who is so affectionate, so much full of love towards His devotees that He will not tolerate, not tolerate any violence towards His devotees and thus the devotees, by worshiping Lord Nrsimhadev, become fearless. Bahir nrisimho hridaye nrisimho, He is everywhere and outside of us is Lord Nrsimhadev, the Lord is in the heart. 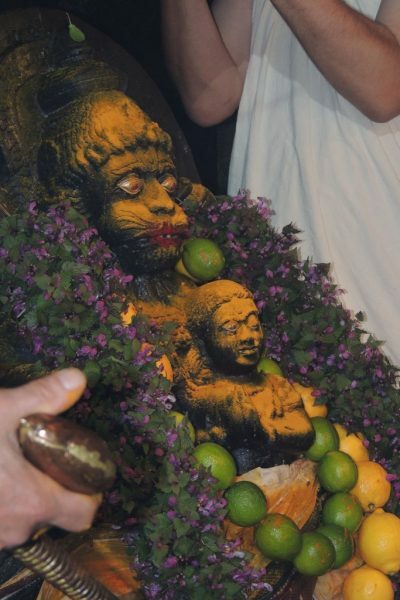 Yato yato yami tato nrisimho, everywhere we are Lord Nrsimhadev is there. In this way, we are feeling very safe and very happy to commemorate this pastime with all its bloody descriptions. I´ll end here. Thank you very much!